* Physicians Desk Reference for Nutritional Supplements. Suggested Use: As a dietary supplement, take one capsule daily or as directed by a health care professional. Warning: Diabetics may use only under a physician's supervision. 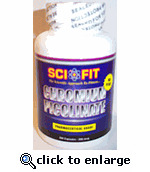 Chromium Picolinate may enhance insulin sensitivity. ** No U.S.RDA has been established.